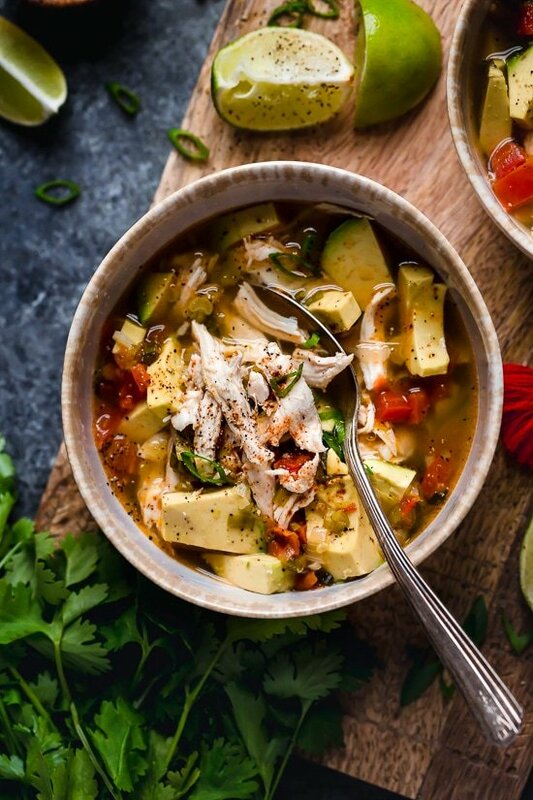 This Chicken and Avocado Soup with lime, scallions and cilantro is my go-to when I want comfort food with Latin flavors. The perfect chicken avocado flavor combo. It’s also really easy to make, and comes together in less than 30 minutes! The avocado adds a creaminess and richness to the light broth and is naturally low-carb, keto and Whole30 friendly. If you wish, you can also add tortillas or serve it with rice on the side. Growing up, my mom made soup practically every night whether it was a first course or the main meal. When she made her Colombian soups, avocados were always on the table to eat with the soup. As a kid, I wasn’t a fan, but as an adult I grew to love them and now I practically eat them every day! If you don’t have shredded chicken, you can cook 2 chicken breasts in the broth until tender, about 15-20 minutes, then shred with a fork (don’t overcook). If you prefer dark meat, boneless skinless chicken thighs work great here too. To make it spicy, add jalapeno or serrano peppers. To pack for work, bring the broth in a thermos or jar with the chicken, and bring the avocado separate, covered with plastic to prevent it from browning. When ready to eat, slice the avocado and add to the soup. Avocados, chicken, scallions and cilantro in a light broth with a touch of lime. If you are an avocado lover like me, you’ll love this soup. Add the oil, 1 cup of scallions and garlic. Sauté about 2 to 3 minutes until soft then add the tomatoes and sauté another minute, until soft. Add chicken stock, cumin and chile powder and bring to a boil. Simmer, covered on low for about 15 minutes. In four bowls, fill each with 1/2 cup chicken, 1/2 avocado, remainder of the scallions, and cilantro. Ladle 1 cup chicken broth over the chicken and serve with a lime wedge. This was delish! I made this yesterday and it’s was quick and easy. I did add a little extra cumin. Thanks for sharing this great recipe. I can’t wait to eat it again today. Delicious! I used baked chicken thighs and breasts that I seasoned verde stye. Also, chicken bone broth. We’re on the Keto Diet…husband and I both enjoyed! This soup is AMAZING! 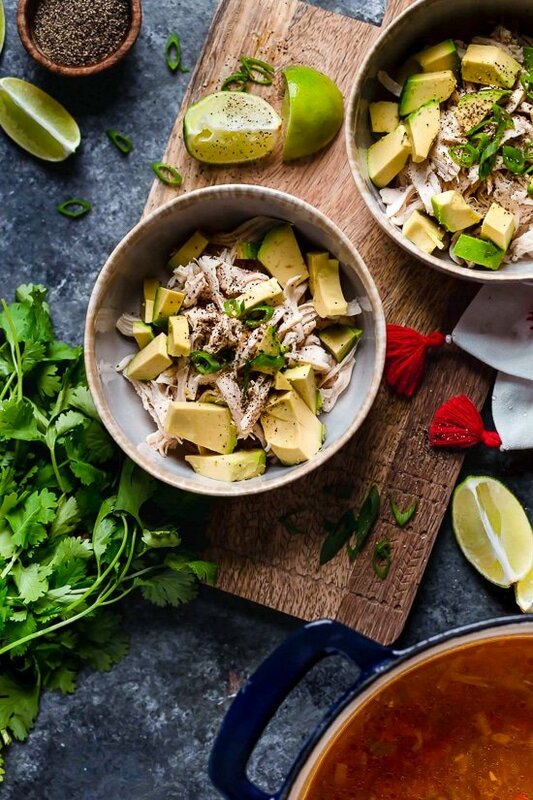 Salty, savoury, light, creamy from the avocado… The broth is simple to make ahead and pairs well with leftover rotisserie chicken. It’s my new favorite lunch! Don’t skimp on the lime and cilantro- it takes the flavour to a whole other level! Just made this fabulous soup for dinner tonight. I will definitely be making it again. So good and so easy. Thank you so much for all the delicious recipes. I have lost 10 pounds in the last month just by using you meal plan. This soup is incredibly delicious. I made it on a very cold, snowy, wintry night in the Northeast. It was comforting and warm, but the flavors reminded me of summers to come…and so healthy! I saw this recipe on The Kitchn. Follow The Kitchn! 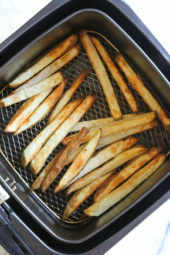 Going to make this tonight! Anyone add in the chicken sooner + cook the broth longer for more flavor? Im worried the chicken wont have very much flavor if it hasn’t cooked in the spices. My picky husband wont eat garlic or scallions, so I am afraid this may be too bland without them…. any suggestions of other flavors to add?! Thank you!! I just made this soup and my husband said this soup is so good, twice! It’s very flavorful and so fresh with the lime juice. Will definitely make this again… and again! Thank you, Gina! I made this tonight and it was very flavorful and tasty! So easy to make! Clarifying question: Does this require chicken STOCK or broth? Ingredient list mentions broth but instructions also mention stock (and broth)? OMG- this soup is the bomb.com. Thank you thank you!! ❤️. This was perfect on a cold night! I added a small scoop of rice to each serving, too. This will be added to our rotation! Just made this for dinner and it was amazing!! 🙂 I love simple, healthy recipes. Will definitely be a follower of yours from now on! Try her Sante fe Chicken! SOOOOOOO easy and delicious. Oh my goodness! This soup is definitely in my top 10 favorites of all Gina’s recipes. I used leftover rotisserie chicken breast and substituted shallots for some of the green onions. If you’ve ever eaten the chicken tortilla soup at Cafe Rio – this is close but even more delicious. I added shredded cheese to my husband’s serving. Next time I might add a few low fat tortilla chips. I’m blown away-the best soup ever! I made this soup tonight ….Wonderful!!!! !I give it 5 stars!!! I added a bit more seasoning than called fur in the recipe. For the last four months I’ve become a Pescatarian, is there anyway I could use shrimp in the soup , And if you could to remit recommend how to do it ? it sounds delicious ???? Can I do this in the instant pot??? Gina, I put nutritional info into WW Freestyle and got 7 pots vs. 4. Did I do something wrong? Soup is AMAZING!! Thanks!! Hi Marty! Are you using the recipe builder? The only accurate way to determine any recipe’s SmartPoints® value is to plug the ingredients into the recipe builder on the Weight Watchers website (Click on “My Foods,” select “Recipe,” and click “Create a recipe.”) which does not count fruits and vegetables in recipes in the calculations as they are now 0 points. How could you make this with a crockpot? Cook on low with the chicken 8 hours or high 4. Haven’t made this soup in awhile, thought I’d whip it up for this cold winter night. 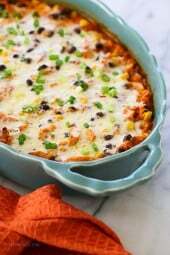 I think this is one of my favorite skinnytaste recipes. Thank you for sharing your delicious recipes and my husband says thanks too! I added 8oz of coconut milk to our batch tonight and it made the broth a little creamy. I have loved it both ways, trust me you can’t go wrong with this one. What’s the sodium in this one??? Hi Gina. 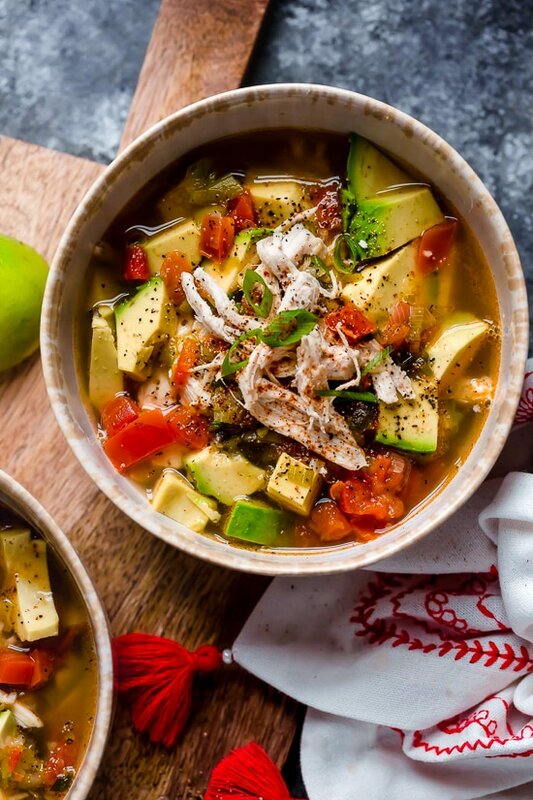 I am a foodie and just by chance I made a chicken soup that was too sparse, so I threw in an slightly underripe large avocado and was stunned at the brilliance of the results. It was a hit and tasted like something new and exciting. So, from one Gina to another, I wanted to see if there was anyone else who had a similar recipe. Only to come across you! Another Gina with the exact same recipe. 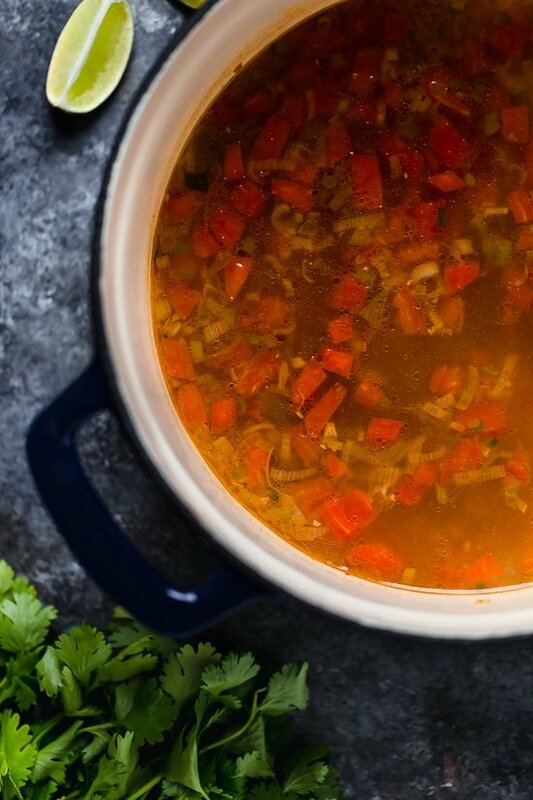 This is the best Chicken soup recipe. Will this soup keep a day or more in the fridge or must it be eaten right away to avoid the avocados from going bad? Sure, the avocado you add just before eating. So only cut what you plan on eating. Made this for dinner tonight and it was great! Very easy to throw together and used leftover rotisserie chicken. Just made this soup…. IT'S AMAZING!! Definitely will make it again! Love love love. My kids (6&2) ate with no hesitation 🙂 this soup reminded me a lot of my moms chicken soup! I added garbanzos (chick peas) when the chicken was almost done cooking; I also used rice as a bed in a bowl– I poured the soup right over it. Amazing, quick, and very comforting for a chilly night. None of your recipes have disappointed yet and I have tried three of four! This one was definitely a hit the only down fall is that there is no left overs! This weeks menu consist of solely your recipes, and we cannot wait to try them! This soup was one of the best soups I've made in a long time! Very healthy & very delicious. The only thing I did different was add in some fresh sliced mushrooms, fresh cut carrots, some baby corn and a bad of bean sprouts. DELISH!!!! 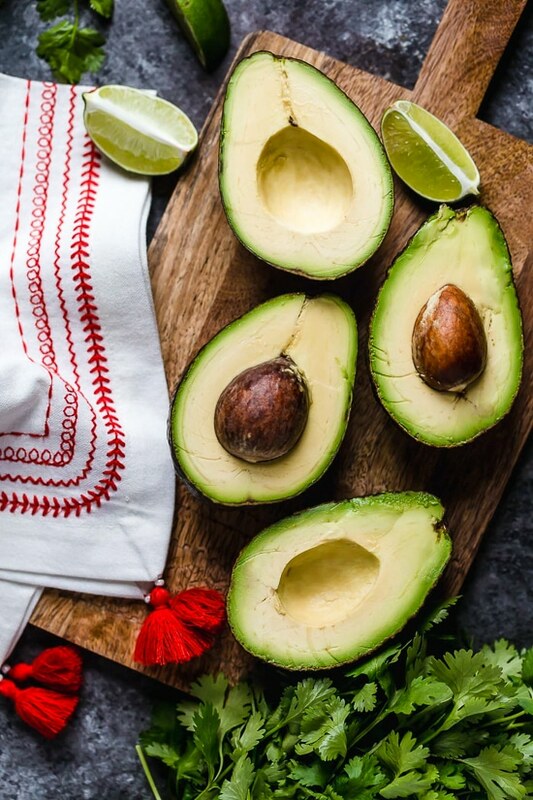 Does the nutritional information for the recipe include the avocado? I made this but made a few modifications: To bulk up the veggies I added 2 carrots and a diced zucchini. I also wanted it to have a lot of citrus flavor, so used 3 small limes. I also added a pinch of smoked paprika and a pinch of cayenne for a little heat. I put 1/4 a cup of brown rice in each bowl as well. Came out really well! Lucky for me I had this soup planned for this evening, because a cold struck me today! Blech! This soup was delicious, filling, and just what I needed 🙂 Hubby loved it too! We added a touch of sriracha for heat instead of chili powder. I made this tonight and it was delicious! My 3 1/2 year old even ate it! Thank you! I also think your blog is wonderful!!! Gina, I make this all of the time. When I am trying to cut calories I cut back on the chicken. Still wonderful! My awesome hubby had this ready when I walked in from work last night – FABULOUS! I am thrilled he is starting to make Skinnytaste recipes. I have been making them for over a year and he is just starting to help with cooking – and loves you too! I just made this again for the second time & substituted shrimp (cooked them in the broth for about 5 minutes). It was just as good as with the chicken & a nice 2nd option! Yummm. Wow, I happen to have a pot of stock working now, and will have a couple left over chicken breast…this may be dinner tomorrow night. Love this soup! We add lime juice, red pepper flakes, and a bit of fish sauce for more flavor. Quick, easy, delicious. What could be better after a busy day? 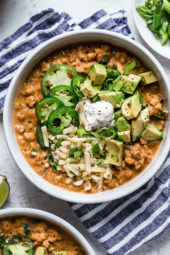 How do you use this with a crockpot saw a comment but no response would love to use a crockpot but based on reviews I will try anyway as I have a lot of avocados to use up and most of the other ingredients. This soup makes me SO happy!!! Just made this for my very, very sick fiancé and he loved it despite his crazy fever 🙂 It was so nice to provide some comfort for him right now! Thank you so much for this recipe! I sauteed mushrooms with the scallions, and just added the chicken to the soup. Delish!!! Very tasty. Someone gave me a bunch of avocados, so this was great way to put these to use. I just made this for dinner and it was amazing. Than you so much for such great recipes! I am such a huge fan of this site! Everything I've made on here has been delicious, and this soup is seriously one of my favorite dishes I've ever cooked, or eaten. So easy, and has all of mine and my fiancee's favorite ingredients. I couldn't believe how yummy it was! Made this for my family (husband and three small boys) and it was a huge hit. Everyone keeps asking when I am going to make it again! Great with corn chips on the side. Thanks! Does this freeze well or is this more of a make & eat kind of soup? Will it hold for up to like 4 or 5 days? It's late tonight but in a cooking mode and looking for having this later on in the week but wanting to make it ahead of time. Thanks!! So excited – I pinned this and so many people at work saw it and got excited too! Just made this! So yummy! Delish Delish Delish! <3 your website! Love this soup so much! Not sure how you get 14 carbs though. I do low carb and I don't see the 14 carbs in one serving…. A whole avocado has 4-5 carbs and 1/4 cup of tomatoes has almost 5. Am I missing something? I live on this soup so I thought I had better ask! One and a half cup scallions is around 10 carbs, chicken broth may have 1-2 g of carbs per cup, depending on what brand you use.